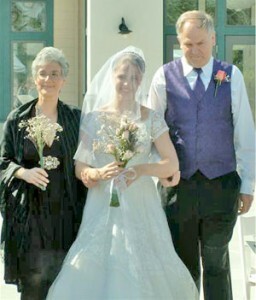 In February of 2011 we cleaned and preserved a wedding gown from Deborah Blumberg of New York. We later received a phone call from Deborah who explained that she was doing research for an article on wedding dress cleaning and preservation for the Wall Street Journal. “had the best presentation”. Deborahs article also includes a summary of the four companies and how they compared in cost, length of time to process, guarantee offered and presentation. We appreciated the opportunity to be included in this comparison. We try hard to do an exceptional job for our customers and always appreciate feedback of any kind, but especially from notable newspapers and magazines. 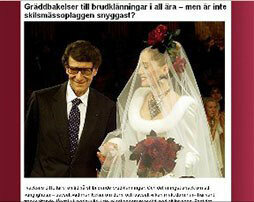 Read the full article on wedding gown cleaning and preservation. Read about a gown restoration that we completed for a June bride here in California. Miranda’s grandmother, aunt and mother had all worn the lovely, vintage gown that she now wanted to wear for her own wedding. The only problem was the dress had yellowed and was several sizes too small. Heritage Garment Preservation provided a little TLC and helped make this bride’s dream come true. We recently had the opportunity to be interviewed by a Swedish radio station featuring a segment on their show all about wedding gowns. The interview was in English, although the show is in Swedish. Our interview is at the end of the show which lasts about 8 minutes. Many people understand English In Sweden, so an English interview is not too unusual.